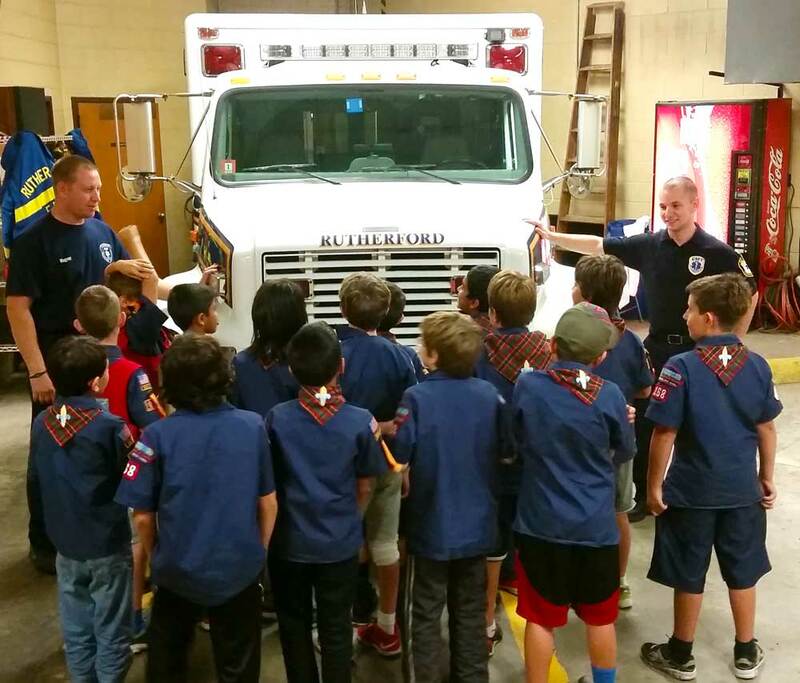 On October 8th, Cub Scout Pack 168 visited the Rutherford Volunteer Ambulance Corps to learn about recognizing an emergency and how to perform basic first aid prior to EMS arrival in order to earn two new badges. The cubs were split up into groups and rotated between four stations ran by an EMT for 15 minutes each. In the first station, Carol taught the scouts about how to bandage minor abrasions and lacerations . In the second station, they were taught when it is appropriate to apply a tourniquet to control bleeding and how to do so by Dan. After that, the scouts moved on to the CPR station where Jason taught them how to perform CPR until a health care professional arrived on scene to assume patient care. In the last station, Cara showed scouts the inside and outside of the ambulance and what supplies were kept in each compartment. Afterwards the four EMTs regrouped and taught the scouts together about recognizing an emergency and when to call for help. The cub scouts were also given insight as to why each member joined the squad and what it is they do while on call. The cubs were quizzed on basic first aid and impressed the EMTs with their knowledge of emergency interventions and uses for equipment. For example, the cubs were showed an EpiPen and most of them knew what it was and when to use it. The scouts shared stories of broken arms and enjoyed getting a chance to use equipment in a hands-on learning environment. 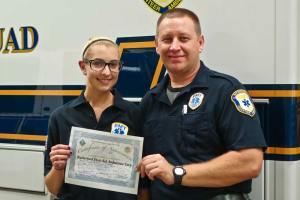 The EMTs were more than glad to offer knowledge to young residents of how to help someone in need. The time spent in the station was a great learning experience on both ends of the spectrum and everyone had fun doing it.